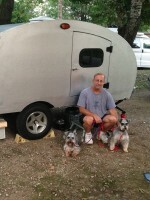 Teardrops n Tiny Travel Trailers • View topic - Battery hold down in galley? Battery hold down in galley? Anybody here put the battery in their galley? I am, but I'm scratching my head on what to do for a hold down method. There's always the cheapo usual two j-hooks to a cross strap of some sort, but that will require drilling through the floor for the j-hooks. If I did this I'd think I should place some reinforcing blocks for the hooks to go through as the floor is .5" plywood. Anybody have a more elegant solution? 99% of the way done with a Generic Benroy. Only because these might never be done if you like to tinker. But it's on the road! I am almost to the battery part of my build. I am putting the battery in the galley in the back of a cabinet. (floor level in a battery box). Have you thought about wide velcro. I have used the 3"x12" stuff and onced it is stuck together, it is the devil to get apart. I used one just like what MadJack linked only I got mine at Academy, I think I have seen them at Tractor Supply also. A battery gives off explosive gasses while charging, so if you are mounting it where it could be exposed to an open flame (ie: stove in the galley) I would plan to use a sealed and vented box such as this one. mechmagcn wrote: A battery gives off explosive gasses while charging, so if you are mounting it where it could be exposed to an open flame (ie: stove in the galley) I would plan to use a sealed and vented box such as this one. Whatever meets those is fine, so I think it makes sense to just pick the cheapest, or most available, or the system you like to work with, as long as it meets those requirements. If the battery has its own compartment, I don't see the need for a box, unless that's the easiest way to meet the floor protection requirement. For instance, madjacks tray/hold-down in a compartment with a vent would be nice. If it is sharing with other stuff, then a vented box is probably easiest... just my guess. If the comparment does not have top access, a box might be awkward for installation and removal. The vented box shown would work in a shared compartment, and the since the bottom half is not much more than half the battery depth it might work okay - but a hold-down bracket is still needed inside that (and presumably bolted right through the bottom of the box and the compartment floor). When I installed a battery in the trunk of a car, I addressed the floor stength issue (the risk of pulling the hold-down bolts through) with a steel strap below the floor, like a huge washer. A bit of thicker plywood could serve the same purpose in the trailer. Thanks for the input. This battery will be in it's own compartment, and will only be charged at home between trips unless I get a solar trickle panel for long trips. I'd open the battery compartment when that is happening to negate the explosive gas problem. I'm most concerned with keep in it in place on bumps. I'll poke around the local trailer/rv places and see what I can see! I mounted a base to the deck, then mounted cases to the base. Batteries go in the case. All secure and tidy with easy access for monitored charging. Which sealed gel are you using? The optima? I used this for my Optima, kind of the fancier version of the one MJ posted but does the same job. mikeschn wrote: Which sealed gel are you using? The optima? While both gel cells and AGM batteries are sealed - actually, they still have safety vents - they're not the same thing. The Optima is an AGM design, not gel. Speaking of being not-quite-sealed, both gel and AGM batteries should have some venting for the compartment when in use, either charging or discharging.